Where should I put the money I save? Home » Ask Tony » Where should I put the money I save? Saving is just the beginning of financial freedom! You already know you should be saving money. However, not all savings are created equal, so deciding where to put the money you save, or discovering how to allocate your assets, is just as important as what percentage of your income you’re saving. No matter where you are in your financial timeline, whether it’s opening your first 401(k) or heading toward retirement, it’s always a good idea to revisit your strategy for saving. Let’s take a closer look at what the investing world calls asset allocation – how you break up your resources and savings – and why intelligent asset allocation strategies are the cornerstone of smart saving. Note that this is not to be considered investment advice and you should have a professional investment advisor create a tailored plan for your personal situation. 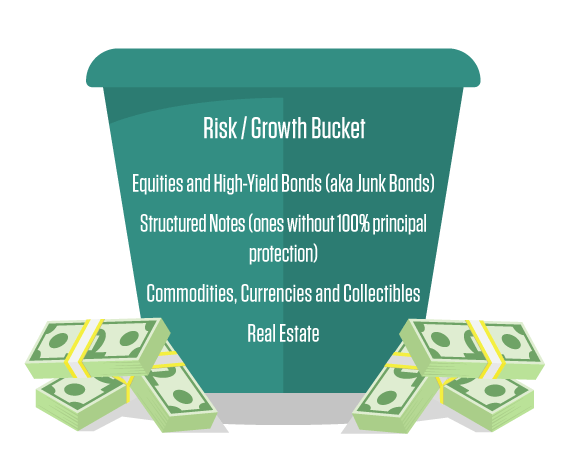 There are three parts, we’ll call them buckets, of strategic asset allocation: your Security Bucket, your Risk/Growth Bucket and your Dream Bucket. By wisely balancing these three areas of bucket allocation, you’ll be able to grow your savings and get closer to financial independence. 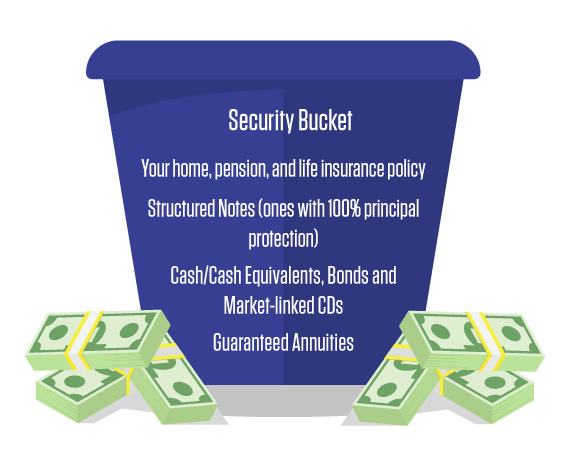 To put it another way, think of these buckets as forming the backbone of your overall financial plan. While no two financial plans or allocation strategies will look exactly the same, following these bucket allocation objectives will provide a simple structure that’s easy to visualize and reference. By separating your funds into these three buckets, you’ll ultimately minimize your risk. You can always add additional buckets of investments to the list, but these three areas should be at the core of your financial future. Your first bucket is the Security, or Peace of Mind, Bucket. This bucket gives you certainty in your life and acts as the cornerstone of your strategic asset allocation plan. It’s like the tortoise battling the hare – slow and steady wins the race. But here winning the race means not losing your life savings. If the Security Bucket were a car, it would be your family’s old Toyota or Volvo with 230,000 miles on it – not the flashy new Mercedes-Benz. The ride may not turn as many heads, but you know you’ll safely get to your destination. Essentially, you keep the part of your nest egg you can’t afford to lose in your Security Bucket. It’s a sanctuary of safe investments that you lock up tight – and then hide the key. It’s a strategic asset allocation because it means you’re covered in case of an emergency. So what kind of investments should you allocate to your Security Bucket? You want investment options with low volatility that you can rely on. 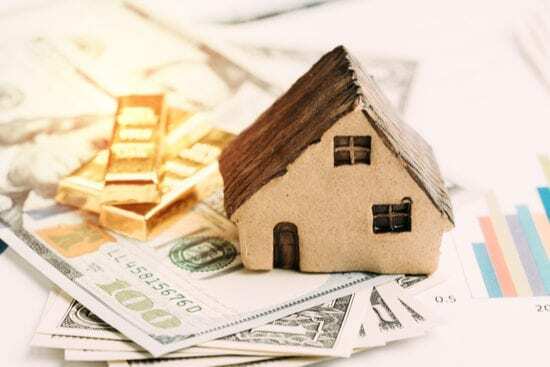 Your home – An asset, but not an investment. This is your sacred sanctuary, so you shouldn’t be “spending” it! The Risk/Growth Bucket of asset allocation is exciting because it can gain some truly amazing returns, but it is usually accompanied by volatility. That volatility shouldn’t scare you away, and the Risk/Growth Bucket isn’t just for serial risk-takers. It’s part of a well-rounded asset allocation strategy and often leads to the biggest returns in the end. Remember, the market will always rise and fall. The most successful investors know that you don’t get out when the going gets tough. The bottom line? Whatever you put in your Risk/Growth Bucket, you have to be prepared to lose or live through volatility (depending on the risk of the investments). Take your time and choose wisely when deciding what percentage of your funds you want to place here. Equities – another word for stocks, or ownership shares of individual companies. Owning individual stocks is far riskier than vehicles for owning many of them at once, like mutual funds, index funds, and exchange-traded funds (ETFs). Depending on your personality type, it can be easy to get caught up in the idea of reaping great returns and forget how much you are risking in the process. It’s a balancing act, and a proper allocation strategy involves finding the biggest rewards that come with the smallest amount of risk. That’s why proper diversification is key when deciding how to allocate savings. Ultimately, it’s the right mix of the Security and Risk/Growth Buckets that makes for smart, strategic asset allocation. Remember, don’t just diversify your savings between your buckets, but also diversify within them as well. As financial master Burton Malkiel shared with Tony, “Diversify across securities, across asset classes, across markets – and across time.” Spreading your money across different investments decreases your risk and increases your upside returns over time. The third and final bucket is for you to have fun with. 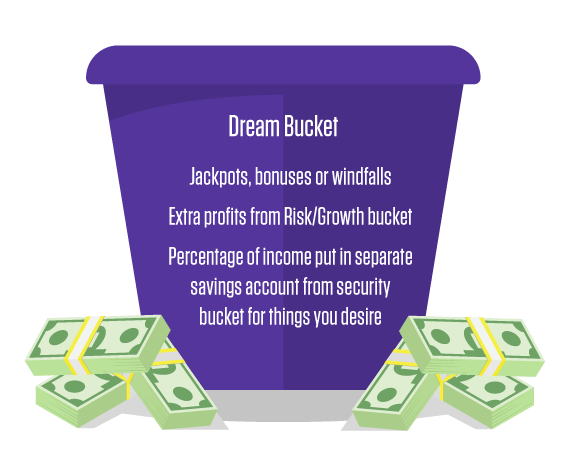 With your Dream Bucket you set aside something for yourself and those you love so that all of you can enjoy life while you’re building your wealth. It’s meant to excite you, put some zest in your life so you want to earn and contribute even more. Sound silly? Think of the items you’re saving for in your Dream Bucket as strategic splurges. They’re a key part of sustainable asset allocation strategies, and also necessary for your own sense of fulfillment and peace of mind. With this bucket, be creative. What can you not stop dreaming about? What would be a glorious experience you’ll remember forever? It could be season tickets to your favorite sports team or local theatre. Maybe a new car – one that isn’t so practical. It could be handing over the deed for a new home to your parents and treasuring the look on their faces. It could be an incredible international vacation. Perhaps you fly a lot and dream of upgrading from Economy to Business Class? Your imagination is the limit. Many people have a lot of money but not much lifestyle. They spend their lives watching numbers accumulate in a bank account and miss out on the joy they could feel along the way. Remember that your dreams are not designed to give you a financial payoff; they are designed to give you a greater quality of life. Don’t just save for the life you want. Make sure you live it by being realistic with your bucket allocation. If you know that travel is a priority in your life, make it a point to save for one big trip a year. Don’t accumulate the funds and let them sit for a trip 10 years down the road. Jackpots – If you get a bonus or a windfall of some kind, use it to fuel your dream tank. Your Risk/Growth Bucket gets a positive hit and you score big. In this case, you may want to take some of your earnings and put one-third of these unexpected dividends into each bucket. You’re spreading out your risk, increasing your security and getting to achieve your dreams. Not bad! Save a set percentage of your income and hide it away until you’re able to purchase what you desire. This savings would be separate from what you’re using toward building your Money Machine. Asset allocation is just one step in creating the path to financial freedom. Armed with this division of savings you’ll be able to better set your future self up for success. Discover more ways to allocate your assets in Tony Robbins’ Unshakeable: Your Financial Freedom Playbook, the bestseller that covers what you need to master your personal finances today. Access the audio content now.